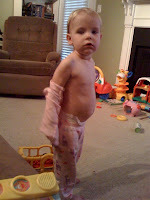 "Little bugger has officially taken her shirt of by herself for the first time. I think we are in trouble..."
So cute! She's totally going to be one of those naked kids who won't leave their clothes on :) By the way, she was adorable at Lyndel's wedding. bugger is a great word. I love the naked baby stage!! we need to get you guys over here!